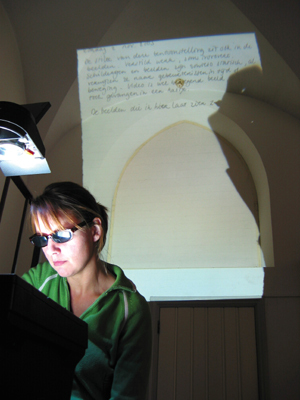 Performance taking place during the exhibition 'Stilte' (Silence) in the Kloostergangen in Haarlem, Kunstlijn 2003. I was writing down thoughts on the theme 'Silence' on an overhead projector. The introspective act of thinking and writing down thoughts for yourself, in search of silence in my head, is in contrast with the projection of those private thoughts enlarged on the wall. Visitors can see me writing word for word, then scratching things out, and sometimes drawing things in between the lines. Because of their reactions a dialogue grew between me and them and their input ended up in my words on the wall too.